Well the 100 mile a month streak came to an end with only 79 miles in February. It was a nice 6 month run that began last August but recovery is far more important than some arbitrary number of miles in a month. Speaking of recovery, I'm feeling really good and proud to say no weight gain either. In preparation for the next cycle, got in a couple TapoutXT core workouts and all I have to say is OUCH! Not having done any specific core work in forever, my abs were screaming once the DOMS set in. With the new month beginning tomorrow, training for Last Chance BQ.2 - Chicagoland starts with an easy 132 MHR 5 miler. Still haven't signed up for the race but booked flights today as well as made hotel and rental car reservations with an eye towards registering next week. Also got my replacement Garmin yesterday and everything seems to be working correctly so I am ready to roll. In the really good news department, things are looking excellent in the PF department. For the past few days it had seemed to feel worse to the point where I began to research treatment options and doctors. While I'm still planning on seeking professional help, I was turned on to a great video by the Sock Doc, Dr. Steve Gangemi, and the relief was immediate (thanks @MichaelSally). Yes, once I massaged out the tight spot near my tibia, the heel pain went away. Go figure. So here we go as the journey on the road to BQ continues. Let me just say that I can't believe it has been almost a week since the marathon. What's even better is that there was very little post-race soreness which came as a bit of a surprise. Even more of a surprise is that I don't miss running as much as I thought I would during this self-imposed recovery period. Having been grinding out miles consistently since last March, it's actually been nice just take it easy and not have to put forth the physical as well as the mental effort that it takes to get out 5-6 times a week. I'm also happy to report that I haven't gained any weight this week as I've been on point with regards to my diet. Once you commit to eating clean it becomes a habit. Also, since I've been keeping my fat intake up, my hunger is suppressed and I've also managed to stay in ketosis. Yay me! It helps to have a great nutritionist in-house too. There has been one side effect to not running however; my ability to fall asleep easily. It's not like I am one of those people that fall asleep easily to begin with but I forgot just how much trouble it was for me. A lot has to do with the extra mental energy I have so my mind tends to race and the slightest little thing can pull me awake as I descend into sleep. Overall my body seems to be recovering pretty well with nothing noticeable in the TFL and only a bit of occasional discomfort in the heel which on a scale of 1-10 it's probably a 1.5 or so. As of now I'll most likely stick to no activity for another week before I get in a stretch next Saturday in advance of a run on Sunday; Garmin or not. On that front, I got an email that they received it and I should have the replacement in 10-14 days. I think I have my schedule pretty much ironed out for the next 3 months. March will be easy base rebuilding, April will be fast and May will be ramping up the mileage. The goal for May through August will be to get in as many 20-30 mile runs as possible. I want to get my body used to this to the point where it becomes easy, relatively speaking. What I mean here is that I can run this distance as stress free as I can run 10-13 now. We'll see how that goes. I also need to decide on a September BQ race. Right now it's a toss -up between Last Chance BQ Chicagoland and Last Chance BQ Grand Rapids with Illinois looking to have the early edge based on flight availability and cost. Other than that both races appear to be equal; loop courses, pacers, "elite" support, weather and flat. IL is probably a little flatter but the small roller in MI is not any concern and could make for a nice change for the muscles. It also may seem trivial but IL has a far more informative website which includes a video of the course. So that's where I'm at right now; nothing too exciting. Now to go and enjoy a beautiful winter day in the desert. It's 2 days post-marathon and I actually feel pretty good. DOMS started to set in last night but another 9 hours of sleep seemed to help. Surprisingly my PF isn't as bothersome as it has been even when I got up both in the middle of the night and in the morning. Actually it's the best its felt in a while. Yesterday I spent some time getting the training plan set for the next 3 months which created somewhat of a dilemma for me. One of my goals for 2015 was to maintain my streak of 100 miles per month but due to taper, short month and post race recovery I'm going to come up 20 miles short. As I was putting together the plan, the competitor in me initially scheduled a week off with 20 miles set for next week so I could hit the target. The pragmatist in me however realized that no matter how good I feel now, I really should take 2 weeks (at least) to heal up and recover. After all, the streak is just an arbitrary number but my ultimate goal is to BQ, run Boston and earn the medal. These things are real. Even though I know that the proper equation is Training = Diet + Workout + Recovery, sometimes you need to step back, think about what is really important and ask for advise. Those of you who know me are well aware that when asked, I'll always suggest rest over trying to push through it, however when the shoe is on the other foot I'm not the best at taking my own advise. Fortunately I have a great support system between Christine and Twitter and the response was overwhelming; Forget the streak, REST! Since I often need to hear things from others to make it sink in; thank you Christine and thank you Twitter. Also, with my Garmin having issues, this makes for the opportune time to send it out for repairs which, will take about 2 weeks. No watch, no HRM, no running. Brilliant. The plan is now for a full week of rest to let everything recover. That means no XT, no stretching, nothing, nada, zip. I've been at it for almost a year now and I need some time off. If, and only if I feel like it, I'll get in some stretching and maybe a little bit of upper body/core XT next week. Or I might be lazy and do nothing, who knows. This is going to be a fun trip, I hope you enjoy following along on my Road to BQ. 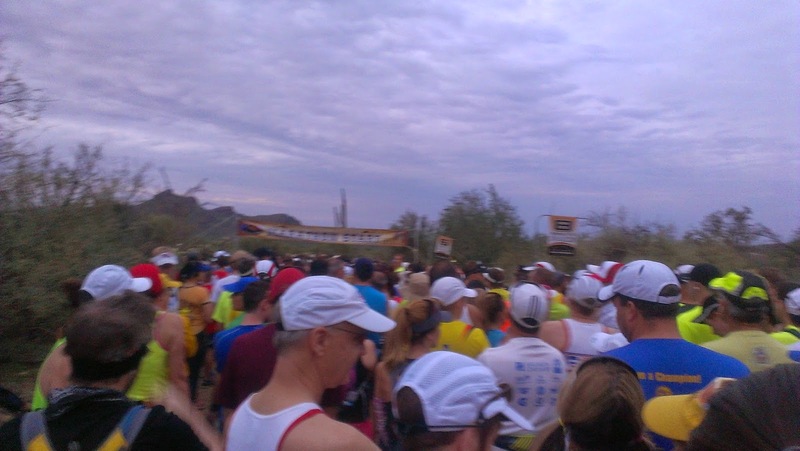 What an amazing experience and what a well-organized race the 2015 Lost Dutchman Marathon was. The day, or should I say early morning started off right as I was up with my alarm at 3:30 as planned; not that I had that great of a night's sleep with the pre-race nerves. Since I was planning on leaving the house no later than 4:30 this gave me plenty of time to have my smoothie, power coffee and be out the door by 4:20 for the 30 minute ride to the shuttle area. Once in the lot I futzed around in my car doing a last minute gear check/mental prep before I boarded a school bus to the starting line. The ride was pretty quiet with only a few runners chatting among themselves. I was pleasantly surprised and quite happy that Christine was up texting me at 5 to wish me well and joke around a bit. I really couldn't have done this without her support during my training and I hope she knows how much I appreciate it. The ride to the start was almost a half hour and when we arrived there the area was set up with mats to chill on with little fires by each to stay warm. They also had plenty of Porta-Potties, water, coffee and food available. Sorry for the terrible picture but it's hard to get a low light shot with a cell phone. With the start of the race an hour and a half away, I found a mat and relaxed for a bit. 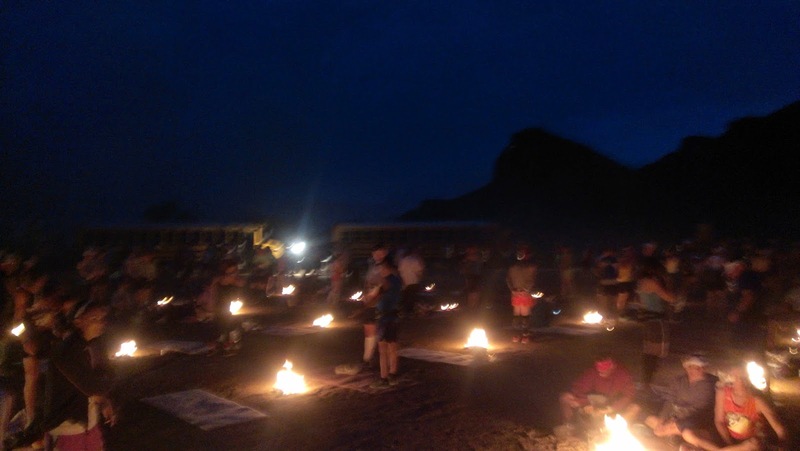 As more buses arrived, there was a need to share mats which was cool and we got to hang out with our fellow runners. My little group included a guy from Minnesota who was on vacation with his girlfriend to visit family and a local girl who started marathoning last January and was now doing her 10th. Just as the sun was starting to come up, Kris of @RaceEverStep found me and we hung out before we had to head to the starting line. Kris and his wife Mindy are great people and so very supportive. They're also organizing the inaugural Run 3rd 5K and virtual 5K coming up in April. Once at the start Kris and I parted ways (he is much faster than me) and I settled in at the 10 minute pace sign. It was only now that it hit me that I was about to run 26.2 miles; holy crap! Fortunately it was a cool and cloudy morning; my only hope was that it would stay this way. When the gun sounded, we were off on a dirt road which would wind up and down through the desert for the first 6 miles. Since it was mostly downhill with an overall vertical drop, my pace was 30 seconds faster than I would have liked at around 9 minute miles but I felt comfortable as stuck with it. Even though I knew there was Porta-Potties every 2 miles along the course, I opted to jump off the course at the 5 mile mark to make a quick rest stop behind the cover of a large bush. With the trail ending we hit the first residential community we were greeted by 20 or so spectators. It always lifts my spirits to see people come out to cheer us on and I make the attempt to thank them for it whether it be a "thank you", a thumbs up or even an occasional high 5. As we exited this community we turned onto US 60 for a mile of relatively flat ground. It was a nice break from the downhill and provided a bland environment to get my head into the run after the fantastic desert scenery we had just left. I knew that once we hit Gold Canyon we were in for the first uphill segment of the course. In hindsight, I should have made it a point to have driven this section prior to the race. The hills were more challenging than I expected and I wish I had been more mentally prepared for them. Still, I had fueled with my ENERGYbits at the 7 mile mark and I was still holding my pace in the mid-9s. There was also great crowd support as we entered Gold Canyon as well as patches of spectators along the way. I also managed to strike up some quick conversations with 2 woman who were there to support someone and kept going ahead after they had passed. It was fun to chat with my "stalkers" and added some levity to the run. The peak of the hills was right about at 13 miles so not only was I half way to the finish but the next 3+ miles were going to be relatively easy. I also knew that I would be heading into the portion of the course that I was familiar with, having run it 3 times in the past 45 days. There would be no surprises, or so I thought. 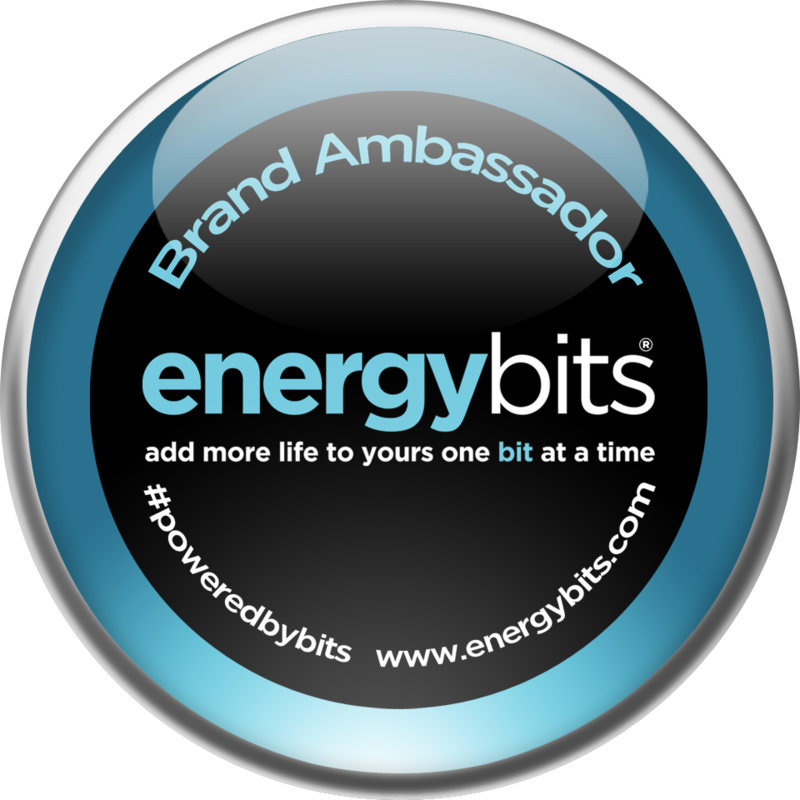 Prior to turning off the freeway again, I took the opportunity to fuel up on ENERGYbits and got ready to take another planned rest stop. This shows how well the race organizers had things set up as at the 17 mile aide station along with water, Gatorade, GU, bananas and oranges, they even had Q-Tips with Vaseline. After a quick stop, I was off to tackle the meat of the course. Having been here before, I was confident in my ability to maintain my pace which had slowed to 9:40ish. Even though my feet were beginning to hurt, I was still feeling pretty strong as I hit the steepest hill at 18.5 miles and actually did rather well attacking it. What I failed to evaluate properly, and was soon to pay the price for, was that at the rest stop I noticed my pee was dark yellow indicating that I needed to hydrate more. Also that the sun had begun to come out with the temps now approaching 80. Not a good combination. Even as I made the turn to begin the decent down the hill I felt good but suddenly, as I passed the 20 mile mark, my legs began to feel heavy and I was beginning to bonk seemingly out of nowhere. This made for a great training/nutrition lesson in hindsight but at the time all I could do was stop and walk. Gone was the illusion of this being easy and finishing strong, now it was a matter of surviving and finishing. The last 6 miles were brutal to say the least as I managed to put together a few good strings of running with some lengthy walk breaks thrown in. The sun was beating down by now but not analyzing my situation clearly enough, I still didn't take in enough fluid nor did I fuel with anything besides more bits and my creamed coconut-raw honey-salt water. In hindsight, and I hope to not make this mistake again, I'll make sure to have some carbs both pre-race as well as during. The support from the other runners was great as people who passed me urged me on. This also included a couple of guys that were in the same boat as me as we kept passing each other then falling back as we took our breaks. These last miles were tough but when I got to mile 25 I realized that I still had an outside chance in finishing under 4:20 if I could step it up. More realistically I could still get in under a 10 minute pace so I sucked it up, completing mile 26 in 10:11. As I made the turn into Prospector Park for the last hundred yards to the finish, I set my sights on passing one final runner as I made my way past the cheering crowd lining the finish chute. I crossed the line with my arms raised triumphantly in the air and when I stopped my watch my time was 4:21:27. 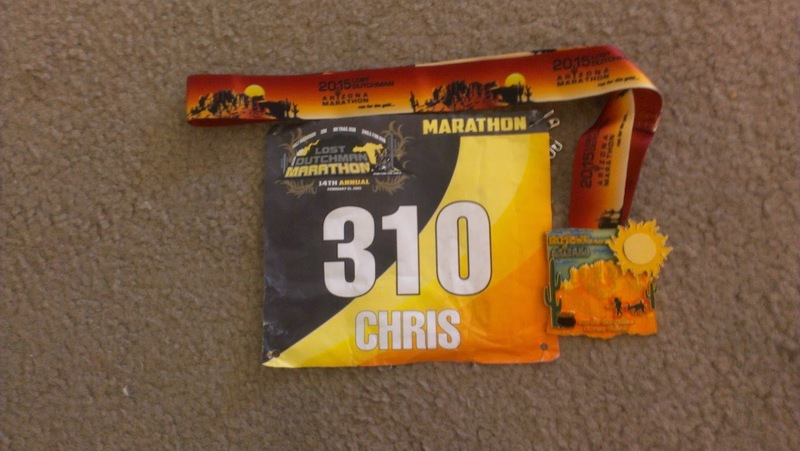 I was a marathoner. It didn't hit me until a few minutes later as I slumped over the railing to catch my breath what this meant to me. I thought about all the work that went into it, my late Father-In-Law who this was dedicated to as well as all the people who supported my along the way. I had an emotional moment then smiled as I pulled myself off the railing and admired my new bling. So there you have it, I finally joined the 26.2 mile club. Well with that 2.9 miles in the books and race day tomorrow, the 2014 season is about to come to a close. It seems like only yesterday that we were stranded in Boston putting the kibosh on my first attempt at 26.2 miles. A year later, as Boston is again getting pounded by a blizzard, I am comfortably at home with temps in the 80s. Now we see how everything works out. The plan was to go easy today but not having run since Monday I was feeling a little antsy and was a bit quick. Once again the hip stiffened some even though I got a good warm up in but within 3/4 of a mile it loosened up and all was good. Or so I thought. Not getting out until almost noon, temps were already in the high 70s which got the HR up over 137 and it didn't want to come back down even as I slowed up. I probably should have walked it down but my ego got the best of me and I just decided to plug along. I really wanted to stretch it out anyway with tomorrow being the race. So now I'm as ready as I'll ever be. No use doing any second guessing over my planning and training as that's all behind me anyway. Going into tomorrow I feel like my conditioning is where it needs to be and aside from some niggles in the TFL and PF I'm injury free. Also after a week of super clean eating with probably less than 20g of carbs a day, I dropped 7 pounds so I'm down to my preferred racing weight of 146. So after 10+ hours sleep last night, a short run and a few hours of gardening, it's going to be another early one with a wake up set for 3:30am. The race starts at 7 with temps expected to be in the mid-70s by 9, it's going to be a warm one. But I'll take hills and heat over snow and cold any day of the week and twice on Sunday. Hated to do it on such a beautiful night but I'm not taking any chances 4 days out. As I've mentioned, I've been dealing with some PF that doesn't bother me much except for when I wake up or have been sitting too long. Pretty much it's limited to heal pain and rolling it with a small ball fixes it up pretty well. Can't really remember when I began to notice i but today I developed a bit of a hot spot a couple inched forward of my heal and more towards the outside of my foot. On a scale of 1-10 this probably rates lower than a 1 but in the interest of being conservative, I decided to take the night off. The last thing I need is aggravate something and it's not like 5 miles is going to make or break my training. If it wasn't for the race or even if it was a shorter distance race, I wouldn't have thought twice about running tonight. It's probably nothing but now I'll just be fresher come Sunday. With race day fast approaching I've also finally worked out my game plan. With the first 8.5 miles being fairly flat and mostly downhill with a 500 foot drop in elevation, I should be able to cruise comfortably in the mid-9s before I hit the first significant hill which continues 200 feet up to almost mile 13. From here until mile 17 it will be more downhill, almost 300 feet, where again I should be able to maintain a fairly good pace in the mid-9s. Since I haven't run, or even driven this section, I have to go by elevation charts that I have found. After this first part of the race is over I'll be in familiar territory, having run the last 9+ miles 3 times already. This will be the toughest challenge of any run I have ever done but having been here before, I know exactly what's ahead of me and aim for staing in the low to mid-10s through the last 2 uphill sections. At least that is the plan. So if I were to put this in terms of a medal winning performance, I would have to say that anything under 4:20 would be gold, under 4:30 silver and just finishing is a bronze. Now if I feel like Superman come race day, who knows maybe I'll shoot for a sub-4.